The Global Human Growth Hormone (hGH) Market is expected to reach USD 7.1 billion by 2025, according to a new report. Rising cases of pituitary dysfunction and increasing use of human growth hormone are likely to drive the market in coming years. Turner syndrome, growth hormone deficiency, Prader-Willi syndrome, idiopathic short stature, and small for gestational age (SGA) are major disorders in which growth hormone (GH) are used. Additionally, growth hormone also received an approval for other indications such as Creutzfeldt-Jakob disease, chronic kidney disease, SHOX gene haploinsufficiency, and Noonan syndrome. Although FDA has not approved the use of hGH as anti-aging therapy, many practitioners offer injections of growth hormones at higher prices. The hGH therapy is aggressively promoted for advanced age symptoms. hGH is anabolic as it accelerates protein synthesis and breaks down fat. Hence, athletes involved in strength demanding activities and sports are likely to use growth hormones for its anabolic effects. It is a fairly common practice among athletes and body-builders to use combination of anabolic steroids and GH for the benefits. • Increasing demand for hGH due to rising growth hormone deficiency diseases and technological advancement such as recombinant DNA technology are expected to propel the market growth. • The growth hormone deficiency segment accounted for the highest share of the market in 2016 and is estimated to observe the fastest growth of the market. 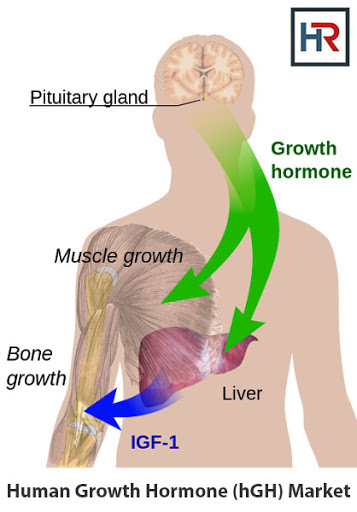 This can be attributed to increasing incidence of pituitary dysfunctioning and investment by major players for the research and development of human growth hormone drugs. • Turner syndrome also accounted for the significant share in the GH market. Large number of patients and effectivity of growth hormone to treat Turner’s syndrome are the key reasons for the significant share in the market. • Geographically, North America was the largest market for GH in 2016 and is anticipated to maintain its dominance during the forecast period due to the local presence of market players, the presence of strong pipeline, and affordability of hormonal therapy. • Asia Pacific is estimated to witness the fastest growth during the forecast period owing to increasing healthcare expenditure, investment by market players, and large patient pool. Furthermore, increasing awareness about the therapy for short stature is likely to boost the demand for GH. • Some of the key players are Pfizer, Inc.; Merck & Co., Inc.; Eli Lilly and Company, Genentech, Inc., Novo Nordisk, Sandoz International GmbH, Ferring Holding SA, and Ipsen.